This just happened to be my lunch one day. I try to gather it up and make it look pretty before I commence working through the lunch hour (happens occasionally). This liquid lunch isn't the Mad Men kind, full for three martinis. No! 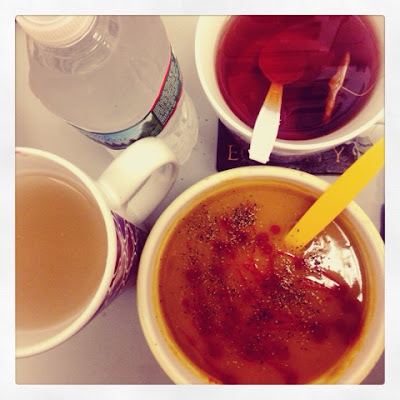 It's a cup of tea (I love tea), bottle of water and Bragg's Unfiltered Cider Vinegar Drink. Plus a big bowl of Pacific Food Butternut Squash Soup with a garnish of salt, pepper and Tapito Hot Sauce. I learned the hard way that if you don't make sure to dissolve the honey in the bottom of the cup first, it won't mix into the cold water well. I love this drink. It's a really good immunity booster. It helps with hydrating throughout the day and is a good, healthy, natural energy drink (as opposed to overly sugary energy drinks).